Police have issued a CCTV image of a man they would like to speak to following an assault in Hedge End as they believe he may be have vital information. The incident occurred between 11.45pm and 11.55pm on Sunday, December 28 on Kings Copse Avenue. The victim, a 40-year-old man, was a passenger in a car that was travelling along Kings Copse Avenue when it passed a group of three men and one woman. One of the men from the group gestured at the car as if he wanted a fight. As the victim was dropped off and got out of the car he was hit to the face by this man causing cuts and bruises. His wife intervened in an attempt to stop the incident and she was pushed by the offender. The offender’s friends then stepped in and pulled the offender off before they ran away. – He was carrying a box of Fosters lager. 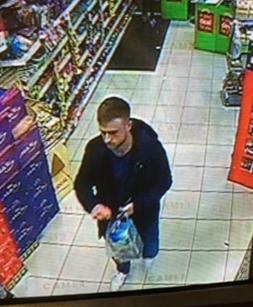 “Do you recognise the man in this CCTV image. We are not treating him as a suspect but believe he may have witnessed the assault and therefore may have important information. Anyone with information is asked to contact PC Misselbrook at Hedge End police station by calling 101. Alternatively you can call Crimestoppers anonymously on 0800 555 111.